Hot Link Pro boosts remote performance with a single box solution including IR transmitter and receiver for controlling hidden AV gear and Hot Link XL Extends remote controls by 200 feet. Hot Link Remote Control Booster Systems double the distance of remote controls with an incredibly sensitive IR sensor to provide solid IR repeating to your hidden AV Gear. The patented, super-sensitive IR repeater Circuit found in both the Hot Link Pro and XL models are true IR repeaters able to “see” your remote control’s IR transmitter commands from twice as far away! Even when hidden on the back of your TV! The IR signal is carefully and immediately sent through the Hot Link without removing the carrier frequency. 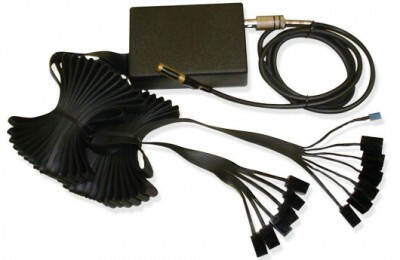 Then sent out through the IR transmitters or “emitters” to the IR receiver of your AV gear. There is a very cool Blue confirmation LED that can be placed almost anywhere to give visual confirmation of remote control commands. Hot Link Pro is an IR Repeater with six IR transmitters for up to six AV equipment devices kept in local cabinets or behind a wall or in an adjacent room. IR Transmitter wires are 7 feet long. Power supply cord is six feet long. The IR Eye cable is 6 feet long but can be extended using the Coax Eye Extension Cable accessory or an RG6 Coax Cable. Hot Link Pro X12 comes with 12 IR Emitters. Hot Link Pro RV runs on 12 volts. Hot Link XL is an IR Extender that separates the IR transmitter and receiver over 200 feet of Cat5 cable for eXtra Long distance remote control repeating to AV gear located in a far off room, basement or equipment closet. Up to 24 IR Emitters can be added in groups of six anywhere along the Cat5 cable. The Emitter/Power Entry module with 7 foot IR Emitter mounts in the AV Equipment closet and the Main Box, Confirmation LED and IR Eye mount behind the TV. 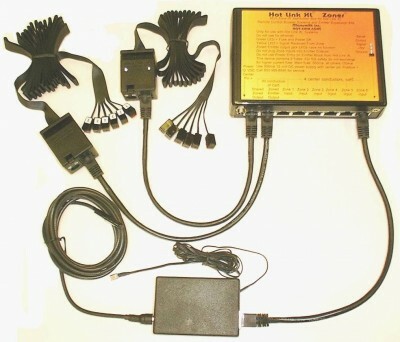 Hot Link handles all frequencies, 18Khz to 120Khz, comes with six low powered IR transmitters and receiver Eye with the best IR repeater circuit for IR extender systems and intentionally does not use IR blasters which can overdrive IR sensors causing distortion of the signal as well as cross-talk for similar AV equipment installed in a remote closet like AT and T U-verse boxes for multiple rooms that all use the same remote codes. 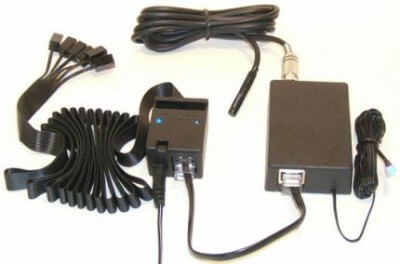 Hot Link is the best darn IR repeater (http://cribmac.com/2011/01/24/hot-link-pro-best-damned-ir-repeater-on-the-planet/), That repeats all frequencies and remote codes and is the very best at mitigating IR infrared interference from plasma and LCD TVs. Hot Link is a single box solution with IR Transmitters and Receiver with the best IR repeater circuit, better than IR blasters, IR extender systems.